I AM LEAVING FOR MADISON TOMORROW MORNING. At 5:55 AM. Good heavens; this is real. I am turning into a real live person with a real live job! Insanity. Anyway, I have a wee post for now, but then I’m going to try that auto-post feature so that I’ll have some sort of content while I’m busy moving halfway across the country. So, um, keep your eyes peeled for that. In the meantime, here is a small review of yet another drink mix I scored from that giveaway a month or so ago. 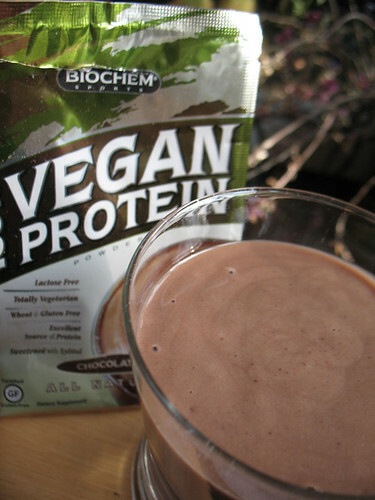 I received both the chocolate and the vanilla variations of this vegan protein powder in my bag o’ swag. Although I am a little wary of protein powders as a rule, I gave the vanilla variety a shot last week – I just dumped it into my normal Green Monster and hoped for the best. Unfortunately, the result was nigh undrinkable, unless you are a fan of powdery-flavored/textured beverages. Yeah, um, not me. If I’d used less powder and more actual yummy things, I bet it would’ve been better. But… I didn’t. After that disappointment, I thought that the chocolate variety might work out better. After all… it’s chocolate, and I’d like to think that anything made with chocolate is automatically going to be delicious. Unfortunately, that may not be true. I kept this smoothie simple – the powder, vanilla almond milk, a banana – in the hopes that it would be lovely and thick and delicious, but really it was just thick, like a pudding except not as yummy. Drat. At least it was drinkable. It probably would’ve been more than passable with the addition of some sort of chocolate ice cream, but I was making do with what I had. Oh well. At least I tried. Well, I’m off to do some final packing and whatnot. Ciao!